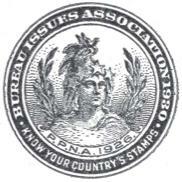 In the year 2000 the Bureau Issues Association became the United States Stamp Society. At the Annual Meeting in Indianapolis at the INDYPEX ’05 stamp show, the Board of Governors formally accepted a new Society Emblem reflecting a proud history that spans 79 years. The emblem, illustrated in Figure 1, incorporates a design first introduced in January, 1936, that embodies the head of the Statue of Freedom as used in the vignette of the $5 bi-colored stamp of the Fourth Bureau Issue (see Figure 2). 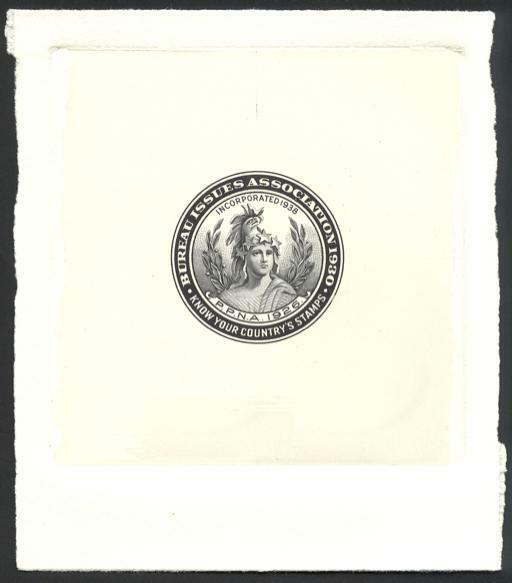 The stamp was incorrectly labeled “America.” Bureau records list the source of the vignette of the stamp as a plaster model of the Statue of Fredom (Figure 3). According to Gary Griffith, former U.S. Specialist Editor and author of United States Stamps 1922-26, an existing engraving in the Bureau’s records was the true source. Figure 1. 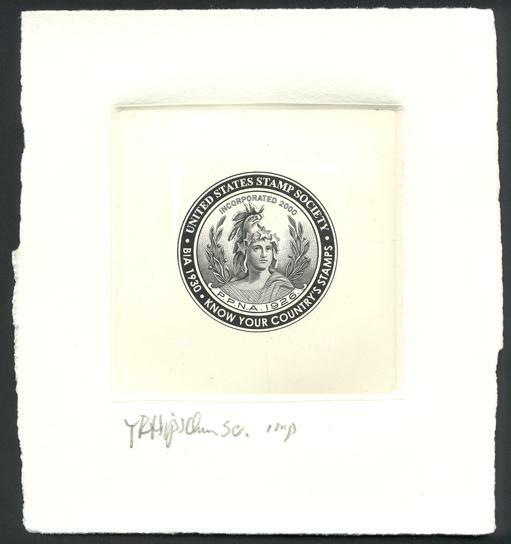 United States Stamp Society Emblem. Figure 2. The $5 bi‑colored stamp of the 1922 Fourth Bureau Issue. The bronze Statue of Freedom crowns the dome of the U.S. Capitol. Her right hand rests upon the hilt of a sheathed sword; her left holds a laurel wreath of victory and the shield of the United States with thirteen stripes. Her helmet is encircled by stars and features a crest composed of an eagle’s head, feathers and talons, a reference to the costume of Native Americans. A brooch inscribed “U.S.” secures her fringed robes. At the top of the outer ring of the USSS emblem is the Society name, United States Stamp Society. The Society’s motto “Know your country’s stamps” appears at the bottom of the ring. The motto goes back to the early days of the BIA. The source of the motto is unclear, but it first appeared in the April 23, 1930 issue (Vol. 1, No. 3) of The Bureau Specialist, the predecessor journal to The United States Specialist. Figure 3. 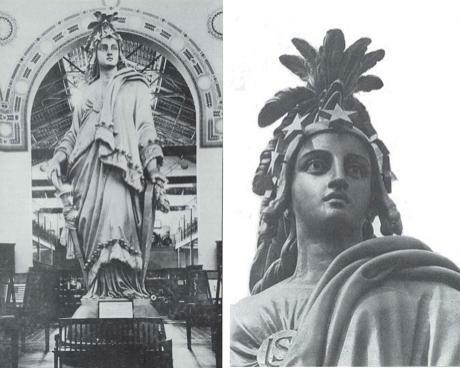 Plaster model of the Statue of Freedom on display at the Smithsonian Institution (left); head of the statue that surmounts the dome of the U.S. Capitol (right). 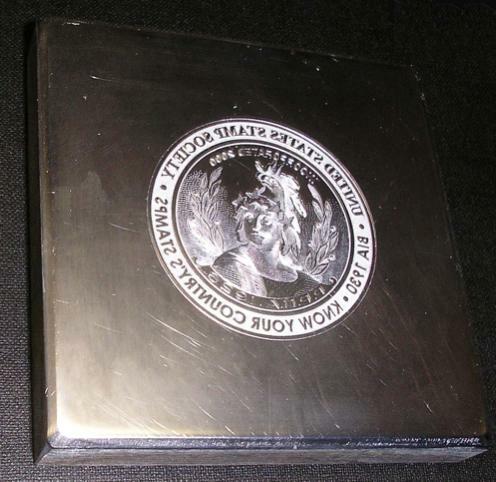 In addition to noting the USSS date of incorporation, 2000, the emblem bears the initials of the names of the two organizations that preceded the USSS. The Society was initially named the Philatelic Plate Number Association (P.P.N.A). The Association, established in 1926, had concentrated on the study and collection of Bureau issue plate numbers. The P.P.N.A. membership had been composed largely of collectors of U.S. stamps generally and Bureau issues particularly. Six years after the Bureau Issues Association was established, an emblem was created and adopted as the seal of the Society. The emblem first appeared in the January, 1936 issue of The Bureau Specialist. In the following month a formal announcement about the new emblem was made by Southgate: “Our members will have noticed the newly designed emblem appearing first in the last month’s issue of the Specialist.” President Southgate stated that, “The development of the design was the work of Mr. Alvin R. Meissner, Head Designer of the Engraving Division of the Bureau of Engraving and Printing whose interest in the Bureau Issues Association and its purposes thus generously shown.” Based on a later reference by Charles H. Yeager, an engraving was created. Unfortunately it no longer exists in the Society’s archives. The Emblem pictured in Figure 4 is printed from the pages of the January, 1936 issue of The Bureau Specialist. Though Southgate had requested that Meissner design the seal, Meissner in turn presented his work as a gift to the Society. 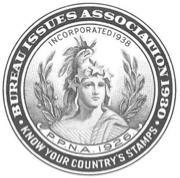 When the BIA incorporated in 1938, an official document seal depicting the emblem was created. That seal included the words “Incorporated 1938” inside the ring, above the vignette. Figure 4. Original emblem designed by Alvin R. Meissner. The seal was engraved years ago by an unknown engraver or engravers. It has appeared in The Bureau Specialist and The United States Specialist and on most official association documents and letterheads for many years. The engraved seal was lost or inadvertently discarded 15 to 20 years ago. No one knows with certainty when this occurred. A number of letterpress cuts and offset prints made from the original seal exist, but they have become indistinct and muddy from repeated reproduction in the U.S. Specialist and other BIA publications. The board of governors decided in 1989 that it would be desirable to have our official seal re-engraved. Two Bureau of Engraving and Printing engravers were commissioned to execute the new engraving. Figure 5 shows the re-engraved 1989 version. The slight differences between this and the original image designs resulted from the engraver’s interpretation of the original design. The new die also added the date of incorporation. A die proof of the re-engraved seal (Figure 6) was approved in January, 1990. Nineteen large die prints were pulled in brown ink for the BIA. These die prints, signed by both BEP engravers, were sold to the membership to defray the costs associated with the newly engraved seal and the 60th anniversary convention. Hopefully one of the brown die prints will surface for display at the USSS room at APS Philatelic Complex at Bellefonte, PA. Figure 6. Die proof of the 1989 re-engraved Emblem, black ink, India paper on card. Tom Hipschen, employed by BEP since 1968, is recognized worldwide as the finest U.S. picture engraver. He is credited with engraving the original master dies for more than 130 BEP-produced postage and revenue stamps for the U.S. Postal Service, Panama Canal Zone, the Department of the Interior and several other production facilities. This body of work has required the interpretation of designs from a wide variety of media. He has created engravings to replicate drawings done in pencil, pen and ink, ink wash and scratchboard, woodcuts, etchings and engravings, rubberstamp prints, copier prints of objects, sculptures, photographs and transparencies, watercolors, acrylic and oil paintings and computer art. Designs have ranged from old master works to spatter paintings, miniatures to murals. Many of these projects demand complicated color separation techniques and pinpoint registration. Hipschen’s work has appeared on every type of intaglio product that the BEP has manufactured over the last 36 years, including Military Payment Certificates, Food Coupons, ID Badges, Passports and Visas, Souvenir Cards, Gas Rationing Coupons, Treasury Bonds, Presidential documents and White House stationery. He has also engraved the official portraits of Presidents Jimmy Carter, Ronald Reagan, George H.W. Bush, William Clinton, George W. Bush, and those of many other government officials. If readers wish to familiarize themselves with Hipschen’s artistry, just open your wallet. He has engraved the portraits of Benjamin Franklin, Ulysses Grant, Andrew Jackson and Abraham Lincoln, and the vignettes of the Capitol, White House and Lincoln Memorial used in creating the U.S. banknote designs. He also engraved the portrait of Mackenzie King that appeared on the face of the Canadian $50 banknote issued in 1988. With 37 years in the Engraving Division, Hipschen currently enjoys the longest tenure of any engraver working at the BEP. He began a formal 7-year apprenticeship as a letter and script engraver at the BEP in September of 1968 and switched to a longer 10-year apprenticeship in picture engraving the following year, becoming a journeyman engraver in 1977. He has held the current picture engraver leader position for 10 years. Picture engraving requires using etching and engraving techniques to produce portraits, landscapes, figures, and ornamental designs in steel and copper dies, employing a manner and style designed to prevent counterfeiting. Hipschen is skilled in the operation of ruling and pantograph machines, and the repair and alteration of dies, plates, altos, transfer rolls, cobex molds and printing cylinders. He has generated images employing photo etching, machine engraving, micro image engraving and computer engraving, and has engaged in a great deal of experimental work for anti-counterfeiting research. He also admits to being skilled in the counterfeiting of existing engravings. Hipschen assists designers in constructing computer-generated images for offset color in intaglio-offset combination projects and has extensive training in hand separation of colors, to form or negate effects in overlapping line patterns. He has trained two apprentice engravers for the BEP and continues to afford technical assistance to them as they advance in skill and responsibility as journeymen. As Picture Engraver Leader, he is responsible for making time estimates for projects and monitoring their progress. In the past he has represented the BEP in panel discussions with the Postal Service and the Citizens Stamp Advisory Committee about stamp production and suitability of artwork for engraving. For several years he was a technical advisor to the Interior Department’s Duck Stamp Office annual art selection contest, briefing the judges on the techniques and problems involved in the translation of paintings into the multi-process combination printing of collectible stamps. Hipschen has traveled extensively on behalf of the BEP and the U.S. Postal Service for various philatelic and numismatic expositions, both domestically and abroad. He has represented the BEP in technical meetings and conferences with most of the major international government and private security printers and manufacturers of printing machinery. The BEP External Affairs office regularly requests his participation in interviews for news and educational purposes through newspapers, magazines, radio, television news and feature programs. Outside of these BEP activities, he has spoken at schools, retirement homes and collectors’ associations about money and stamp making. Hipschen is the recipient of numerous awards and honors. In 2004 he received the Thomas J. Crayton Award for over 36 years of conscientious and dedicated service creating exquisite designs and engraving productions supporting Bureau of Engraving and Printing security and technology. He has maintained a freelance art and engraving practice outside of government responsibilities, producing fine arts, commercial and security products. His clients have included The Bank of Canada, The White House, The American Horticultural Society and The United States Stamp Society. Figure 7. Die proof of the 2005 engraved die, black ink on India paper on card, signed by Thomas R. Hipschen. In 2004, the Society Board of Governors authorized the creation of a new emblem for the United States Stamp Society. Tom Hipschen was contacted in March of this year, and he agreed to redesign the emblem and create a new engraved die. Hipschen had some difficulty obtaining a block of steel of sufficient quality for the engraving. Eventually a block 77 mm x 77 mm one-half inch thick steel of superior quality was secured and work on the die was begun in mid April. The die was completed May 7th and four proofs using a banknote black ink were pulled on a variety of papers, all signed by Hipschen. A clay coated glossy surface “photo” type yielded the coldest, sharpest, reproduction. It shows what is “in the die,” as the old engravers used to say. The second paper, Fabrianio Tiepolo, is a quality art paper, delivering a very full impression. Another is on a thin, lightweight paper similar to that used in laser printing. The last is a proof on very old “India” paper of the type used by the entire banknote industry from the late 1880s until WWII (see Figure 7). It yields the sort of “golden” image that the printers were supposed to try to match. A scanned image of the glossy die proof was sent to the Board for approval. The die illustrated in Figure 8 was hardened and chromed by The Cronite Co., Inc., Parsippany, NJ during the last week of May. Figure 8. Hardened and chromed 2005 die engraved by Tom Hipschen. 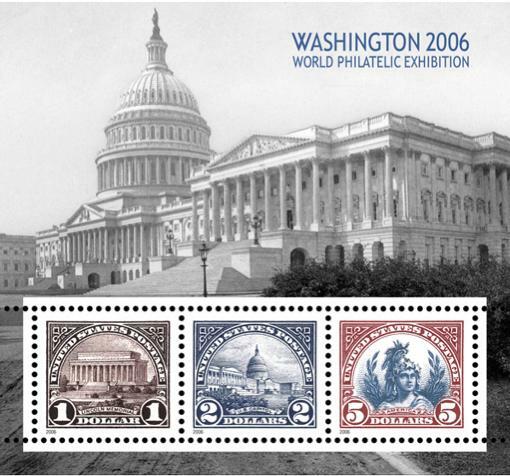 Our Annual Meeting in 2006 will be held at the Washington 2006 World Philatelic Exhibition. Many events are planned for this important event. We will have a book release ceremony for the Encyclopedia of United States Stamp Collecting and possibly one for the new USSS Checklist of Booklet Covers 1900-1975. In addition to a tour of the BEP’s Historical Resource Center, we are planning a reception at the National Postal Museum. The USSS will have a booth for the duration of the week-long show proudly displaying our new emblem. It is also worth noting that the vignette of our emblem will be officially recognized as well at the Exhibition. The United States Postal Service has announced they will issue a Souvenir Sheet commemorating the Exhibition (See Figure 9). One of the three stamps in the sheet is a reproduction of the $5 stamp, the source of our original emblem. Our new emblem is a worthy tribute to the thousands of our members who for seven decades have contributed to the research and study of United States Postage and Revenue stamps. Figure 9. Souvenir Sheet planned for release in May, 2006 for the Washington 2006 World Philatelic Exhibition.